Pujya Sri Swamiji arrived in Seattle’s Boeing airfield from Los Angeles at 6:30 pm on Tuesday, 4 September 2018. His Holiness’s visit to Seattle was ten years in the making - as He said to the worshippers gathered for His benediction at the Sri Lakshmi Venkateshwara Temple on the morning of the 5th, there was nothing accidental or coincidental about the timing of his visit. Smt Sarvani Sathish, a fourth generation devotee of Sri Swamiji, and her husband, Sri Sathish Kumar Manivannan, He said, had repeatedly entreated Him to visit, but the eventual timing of His visit was orchestrated to the nano-second to bring His grace and benediction to those most in need of it. 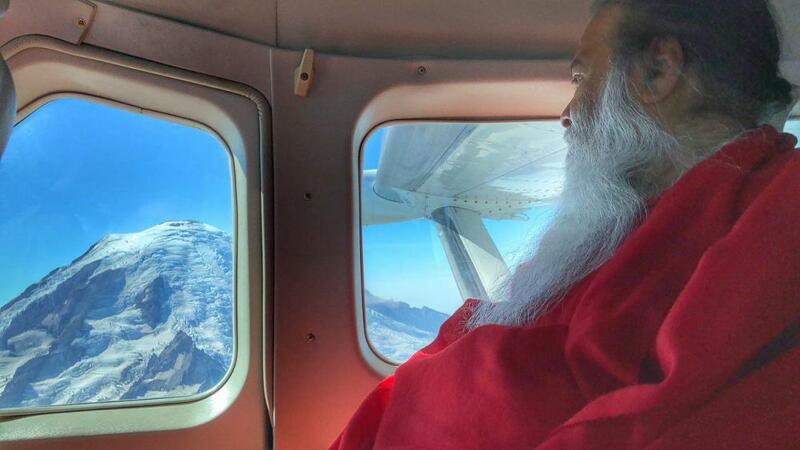 Later that afternoon Sri Swamiji embarked on a 90 minute flight tour by a Cessna Caravan wheel-plane around Mount Rainier’s 25 glaciers – the largest collection of permanent ice on a single US mountain south of Alaska - and Mount St. Helens’ 2-mile wide crater caused by the massive eruption in 1980 which became the biggest in history. After the flight tour, Sri Swamiji visited the Chihuly Garden and Glass permanent exhibition at the Seattle Center featuring Dale Chihuly’s avant-garde experiments in glass art. Those present could sense how the vibrant colour and creativity in the massive architectural and botanical glass installations on display resonated with the energy of Sri Swamiji’s presence. Sri Swamiji then took the 41 second elevator ride up 520 feet to the observation deck in the Seattle Space Needle, and walked down the Oculus Stairs to the Loupe, the world’s first revolving glass floor, with views of Seattle literally at Sri Swamiji’s feet. The morning of the 6th, Sri Swamiji gave opportunity for Pada Puja to Smt.Sarvani’s family, at which members of three of five generations of Sri Swamiji’s devotees had the grace of His Darshan. He then traveled to Issaquah to bless Sri Madhava Sastry and his wife, who had had the unique privilege of hosting Sri Swamiji on His first visit to Seattle in July 1985 while he was en route to Montana from Alaska. The same afternoon Sri Swamiji cruised Lake Washington with sixty worshippers on board - which Sri HV Prasad acutely stated was a metaphor for the real cruise his devotees are privileged to undertake with Him, the journey on the ocean of samsara with Him as our compass. 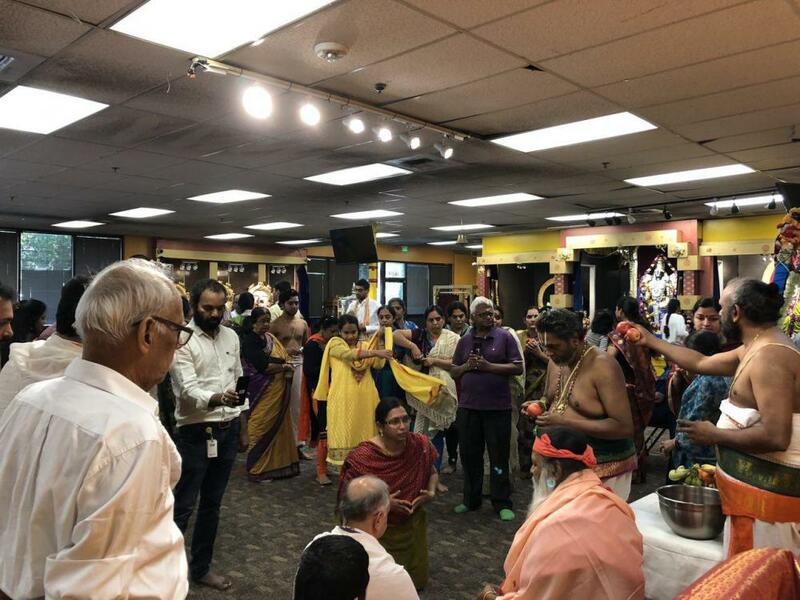 On the penultimate day of His visit, Sri Swamiji gave public Darshan at the Redmond Senior Center to over 400 worshippers gathered there chanting Om Shivaya Rudraya Namaha and Hanuman Chalisa. The chanting was led by Sri Suryaprakash and Sri.Rahul Sista. Smt Sarvani Sathish welcomed the gathering. Her father, Sri CVS Rama Rao, a retired officer of the Indian Administrative Service, spoke stirringly of his experience with His Holiness and of the path he had traveled from skepticism to pure faith. Sri Deva Datta Sunkara, a third generation devotee, spoke of his father being a living testimony of Sri Swamiji’s healing power in the face of his battle with blood cancer in 1995 and heart disease more recently. In His discourse, Sri Swamiji drew attention to the stunning Shivalinga sculpted in ice which was set on stage and told the audience the story of why worshipping Hanuman is to worship Shiva and vice versa. The story of Gardabhasura is a lesson, He said, in why the pursuit of immortality in life is a demonic desire that is fated to be slayed like Gardabhasura was slayed by Maha Vishnu. And the worship of Maha Vishnu (in Rama avatar) by Shiva (in Hanuman avatar) and our contemporary worship of Hanuman-Shiva is the pursuit of true immortality - the immortality of spiritual experience, beyond the ephemeral nature of human experience. The pursuit of Vairagya is true experience, it’s non-pursuit is Daridra (impoverished experience). Sri Swamiji said everyone in the audience had a unique singular relationship to Him and that the time had now come to bring that relationship to fruition and assured everyone present that if their devotion rang true He would return to Seattle to give a concert for healing and meditation next year. Sri Sathish Kumar Manivannan expressed his gratitude to Sri Swamiji and spoke of the generosity of Sri Swamiji in opening his heart and mind to anyone who wished to serve Him without distinction. 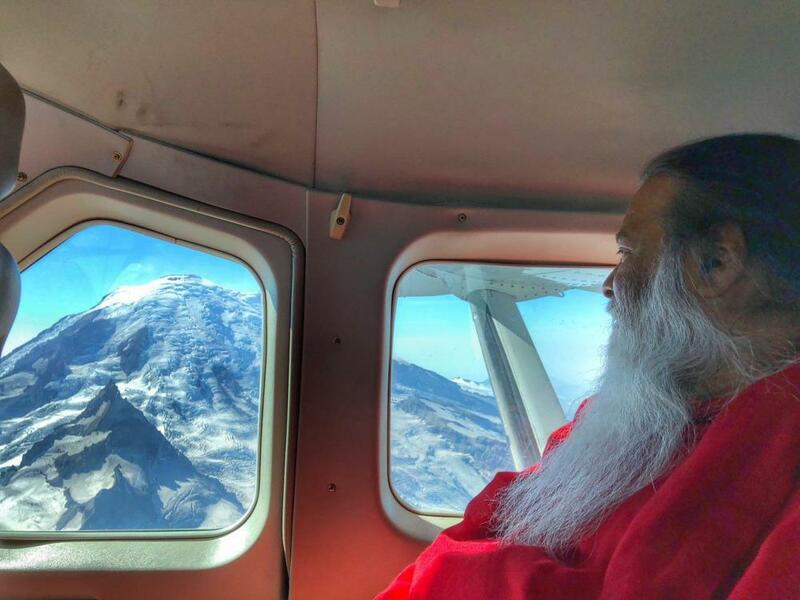 Sri Swamiji departed Seattle for Dallas at 1 pm on 8 September 2018, having touched many more hearts with His love, all of which now appear to beat with one desire only - to welcome Sri Swamiji back in Seattle next year. 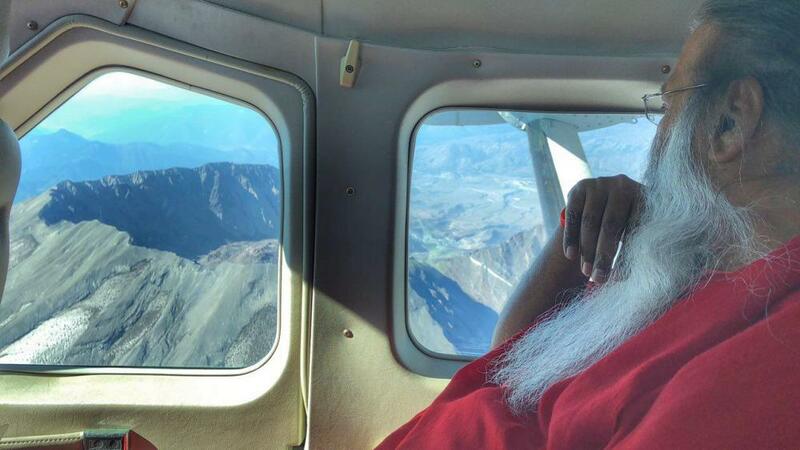 During an aerial tour on 5th September 2018, Pujya Swamiji looks at the now dormant Mount Helen, a volcanic mountain which burst in 1980.